Expedition 372 has been a bit of a different expedition for most of the technicians and crew in that we were only coring ~190 meters of sediment and were spending the majority of our time Logging While Drilling (LWD). Since LWD is not a common operation for the JR, I had some questions about what it’s like on the operational side as well as what the purpose of LWD is for the expedition 372 scientific objectives. First, I got a chance to talk with one of the JR drillers to see how LWD is operationally different from normal drilling. How often does the JR do LWD? The JR is mostly a coring rig, so LWD is more-or-less non-existent. The last time the JR performed LWD operations was probably at least 5 years ago. While LWD is uncommon on the JR, it is extremely common on oil rigs and some of the crew members have backgrounds in the oil industry and are well-versed in the operational procedure. What is the procedure for LWD? How do you get set up? Other than drilling speed and pump rate limits, the set up and procedure for LWD is no different than regular drilling for the rig crew and driller. The pumping provides power to the tools located just above the bit and the tools send data in the form of sound waves up the pumping column. Otherwise the initial set up is with the LWD tools rather than with drilling pipe alone. When you reach the seafloor, what happens? If the seafloor sediment is expected to be soft, a camera is sent down to determine an accurate seafloor elevation. 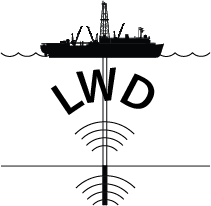 The data collected by the LWD tools is relative to the top of the seafloor, so it’s important to have an accurate elevation. An 8.5 inch drill bit is only used with LWD and once the seafloor is reached, the pumping speed and bit rotation is reduced to best collect data from the soft sediment at the top of the hole. Once the hole is open, what do you have to do? The important things are to make sure the hole is straight, so the LWD engineers who manage the tools keep a close eye on the pressure and inclinometer readings. Well, there you have it! Expedition 372 is getting to do something rare and exciting for scientists trying to understand the shallowest sediments of the seafloor! LWD provides some literal “ground truth-ing” to clarify what is seen in more traditional remote sensing ways of viewing the shallow seafloor.